This Shabbos I had the tremendous privilege to be a part of something amazing, beautiful and enlightening. I am hoping El Al will see this and understand that there is a much better headline than the false headline “Haredim Riot On Plane,” which I currently see online. Here is the short of it. Our El Al flight was supposed to leave at 6:30 p.m. Three members of the crew were late and we started boarding at 8:30pm during which the crew members arrived. At 9:10 p.m. the flight doors were closed and everything was calm for about an hour. At around 10:00 p.m. many of the passengers who were concerned about Shabbos starting asking the crew members for detail about departure and no answers were given other than we are leaving in five minutes. Keep in mind, that at 10:25pm sitting on a JFK runway, El Al’s website showed our flight as enroute having departed at 9:30 p.m.. I was sitting in business class, my seat was directly next to the stairs going to second floor, and three rows behind the first class food-prep galley. I heard every exchange. At no time was there any physical threat presented by passengers concerned about Shabbos. I am loathe to use the term Chareidim, this was not some Neturei Karta protest full of black-clad chassidim spewing nonsense. These were Jews from all walks of life and varied backgrounds who were concerned about Shabbos. At 11:35 p.m. there were about 40 passengers, myself included, who stood by the exit door and expressed our wishes to disembark from the plane. By this time we were sitting on the tarmac for two and half hours. One of the stewardesses told us that if they take us back to the gate and we get off the plane we would lose our tickets and not be rebooked. I am not sure if she was trying to shock us into sitting or if this was the real policy, but our response was unanimous;. every single person said that’s fine, we are ok with that, just take us back to the gate so we don’t violate Shabbos. Not one person said, “What?? No, you have to rebook us,” or, “You can’t do that.” There was a simple, basic understanding: We had Shabbos. At one point, someone – whom I later found out to be Rabbi Shalom Ber Sorotzkin – got on the intercom and said that he spoke to the pilot, and that the pilot guaranteed we would get to the airport before Shabbos, and that he (Rabbi Sorotzkin) arranged for everyone to have a place and a meal for Shabbos if they did not have time get to where they needed, since we would arrive only one hour before Shabbos. Many of us, myself included, did not sit down and expressed our desire to go back the gate. I can’t begin to describe the sinking feeling in my stomach as I saw the plane turn away from the terminals and face the runway. Less than six minutes after the captain told us to return to our seats to go back to the gate, we were in the air. There was no wi-fi on the flight, which meant that our only source of information for the rest of the flight was the El Al crew. Four hours into the flight, the captain announced that because of the “chairedim,” the plane would stop in Athens – at which point all the people who want to get off for Shabbos can get off the plane first, and then, (and here is the kicker) all the people who want to continue to Israel will also have to get off the plane and go on a different plane from IsraAir to go to Israel. What a shame. I wish El Al had announced the truth: We were stopping in Athens because El-Al made a series of bad calls, and once they landed they could not depart on Shabbos, which is why they needed an non-El Al plane to continue to Israel on Shabbos. This only caused the internal tension to rise. And our only source of information was the crew, who were less than helpful and not at all sympathetic. To be very clear, no one was angry at the stewardesses; everyone understood that they did not make the decisions. We were requesting to speak to the pilot or someone who could speak for the pilot. Again, there were no attempts to break into the cockpit, and there were no physical altercations. Yes, there were some raised voices, but most of the time (I have the videos showing) it was secular Israeli passengers who came to yell at the passengers who were concerned about Shabbos that we were ruining their weekend. This in itself was absurd, because we did not make the decision to stop in Athens and the majority of the religious passengers preferred that we continue to Israel and be stuck in the Tel Aviv airport. As the minutes crept closer to our arrival in Athens, there were discussions on the plane about whether it was halachically better to stay on the plane or disembark in Athens. We had no clue what to expect. Would we stay in the airport? Was there a hotel? What would we eat? When they served breakfast, I realized that the packaged egg which they served for breakfast and the half-sandwich I had left from when I boarded the plane could very well be all we had to eat on Shabbos. I even put some nuts into my backpack for Shalosh Seudos. When it was clear that we were landing in Athens and we would begin our descent, we returned to our seats. Many of us tried to separate our muktzah items and to make sure our tallis and siddur were easily accessible. After the plane landed and we stopped, we disembarked on one of those rollaway staircases to get onto one of several shuttles. I was one of the first people onto the shuttle and I watched as dozens more Yidden came off the plane with no other thought than that to stay on the plane would be chillul Shabbos and getting off the plane was the best chance of keeping Shabbos. Chassidim got off the plane, as did men with black hats, colored shirts, t-shirts, in suits, women with sheitels, snoods, no sheitels, in skirts, in pants; everyone coming off the plane was united in one thing: We believe in Hashem, and His Torah, and Shabbos was our gift and our inheritance and we would keep it. As the first shuttle was full and started toward the airport (there were more shuttles behind us), everyone broke into a song for Shabbos Kodesh. Once we got to the airport we were met by a women from El Al who was very sweet and took the time to explain to us that we were would be staying across the street (literally) at a hotel, and that they would take us as soon as the other shuttles arrive. As they led us into the hotel, it was very chaotic. There were four hotel clerks and people started surging toward the front desk. At that point, one Rabbi, whom I later learned was Rabbi Akiva Katz, yelled above the crowd and explained to everyone that we would need to create orderly lines in order not to overwhelm the clerks. He also let us know that they had set aside a place for davening and that Chabad had prepared food. This helped reduce the stress in the room, and the process became more orderly as people were focused on getting to their rooms and ready for Shabbos in the 40 minutes we had left to shkiah. Walking into Kabbalas Shabbos (I was late) was beautiful. The room was full of 60 or 70 men and about 10 women, and everyone was singing. Rabbi Jesse Horn from Yeshivah Ateres Kohanim led Kabbalas Shabbos. We were all so happy to be able to keep Shabbos, and the davening and level of simchah was very high. I think we must have danced four or five times during Kabbalas Shabbos and Maariv. 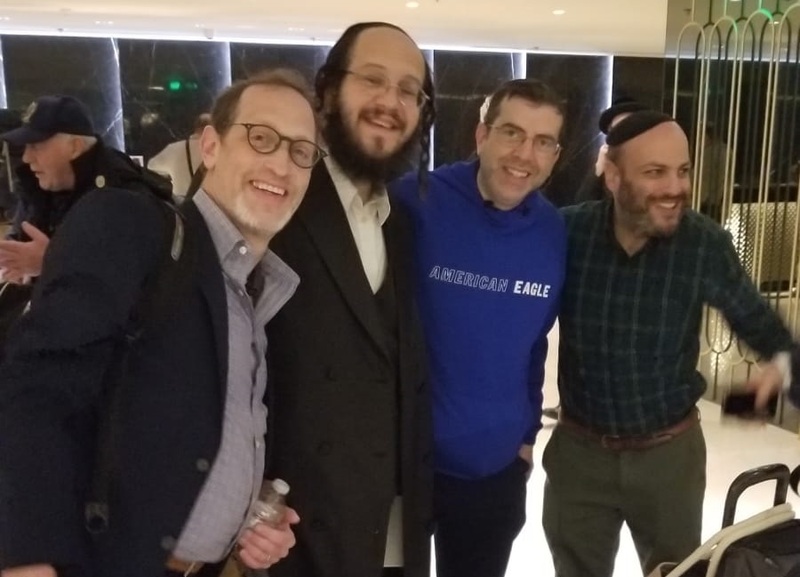 After Kabbalas Shabbos we walked through the hotel to the dining area, and I can tell you with 100 percent conviction that what I saw was beyond anything I could have imagined. Eighty-five percent of the dining area was reserved for our Shabbos meal. The tables were set beautifully with bottles of wine, grape juice and challah rolls. The place where the hotel usually displayed its salad bars and assortment of cold meats was now filled with platters of gefilte fish, six or seven large bowls with a variety of salads and dips. It was as if this had planned for weeks in advance! There was plenty of fleish for the main course and an assortment of side dishes to accompany it. The seudah was beautiful. Everyone sang zemiros and niggunim, and there were many divrei Torah. Several people had stopped at the duty-free store to get bourbon and scotch for the oilam; and it was very leibdige, and the singing went on for quite a while! I woke up several times during the night, as I was still on New York time, and every time I went downstairs to the lobby, there were people learning together or talking about the parshah. Shachris was another beautiful davening, and it was interesting to see how it was a mix of Nusach Sefard, Sefardi, Ashkenaz. After davening, several people went to the kitchen to help Rabbi and Rebbetzin Hendel (the Chabad Shluchim in Athens) prepare for seudah. After the shiurim we went to the dining room, where, like the previous night, there were copious amounts of delicious food, a wonderful meat kugel wrapped in pastry, brisket and a large assortment of salads. Unlike the previous night, when everyone sat next to people who were closest to them hashkafically, the seating during the Shabbos-day seudah was heterogeneous. Chasidim sat and schmoozed with Tzionim, Modox sat with black hats … I only use these labels so you can visualize the seating, but there were no labels at this seudah; we sat in true achdus. The rest of Shabbos and the subsequent trip back to the airport and our return flight to Israel was unremarkable, and I won’t bore you with the details. Rabbi Shalom Ber Sorotzkin, who had the foresight before the plane took off to have his organization contact El Al and Chabad and put pressure on to make this Shabbos happen. Rabbi and Rebbetzin Hendel, the Chabad Rabbi and Rebbetzin based in Athens, Greece. They got the call at 11:00 a.m. Friday, and by 4:00 p.m. they had prepared a beautiful Shabbos for 150+ adults which was not lacking in anyway. Now a quick note to to El Al: Hi El Al, I don’t know who handles your marketing and social-media program, but you wasted a huge opportunity. Next time this happens, here is what you do: You make sure you get the same hotel and that Chabad sets up a beautiful Shabbos. You hire a Greek photographer and video guy, you video the amazing Shabbos – and then you promote it as an El Al-sponsored Shabbos Unity. If you need more advice, feel free to call or email me, or just send me some tickets as a thank you. I would like to leave off with a few thoughts, having just spent one of the most amazing Shabbos of my life. 1. 150+ Jews from all backgrounds and hashkafic orientations, wearing every outfit possible walked off a plane with one thought: We will keep Shabbos, even if it means sleeping in an airport. 2. Unlike our great-grandparents, who were fired if they did not work on Shabbos (USA), or who were ostracized, and possibly incarcerated for keeping Shabbos (USSR), how often do we get a chance to be moser nefesh for Shabbos? This was a tremendous gift from Hashem to us that we had the chance to show Hashem how much we love Him and his Torah, and we ALL took it. 3. Every parent in that hotel who was not able to be home with their children that Shabbos taught their child a lesson that they could not have taught them in a hundred Shabbosim at home. They showed that Shabbos means so much to Mommy, Tatty, Ima, Abba, that they would walk off a plane in the middle of a foreign country with no guarantee of food or a place to sleep. 4. Yom Tov in the Beis Hamikdash was probably like this Shabbos. Jews from all over coming together for Hashem and his mitzvos. I hope to see all of my fellow passengers this Pesach bringing korbanos in the Beis Hamikdash. May we be zocheh to see Moshiach and the return of the Beis Hamikdash. Over the last 30 hours I have received 100’s of emails, whatsapps, texts, etc, from Jews all around the globe expressing their gratitude for writing about the experiences last Shabbos and how it moved them. There is an underlying Yisod in our Torah that when a person feels such a Hashgacha, that it is imperative that there also be an accompanying action so that the emotional surge, which is ephemeral in its very nature, takes root and grows into something bigger. Without an action, it was just a feeling, we had it today, and it is gone tomorrow. The Ramban explains on a posuk in Shir Hashirim: Hishbati Eschem.. Im Ta’iru Ve’im Te’oreru Es HaAhava Ad Shetechpotz”. If you are going to have a Hisorerus of Ahava, you should make into a Chafetz, a Maaseh. I heard from my Rebbeim that there are at least two places we see this principle brought into play by our Avos. The first is by Akeidas Yitzchak. After Hashem told Avraham “אַל־תִּשְׁלַ֤ח יָֽדְךָ֙ אֶל־הַנַּ֔עַר “the pasuk then tells us that Avraham sacrificed an “אַ֔יִל אַחַ֕ר” in place of Yitzchak. The meforshim explain that it was necessary for the Torah to tell us this because if Avraham had not done a “Peula”, an actual action, we would not have the Ma’aseh Aikeda today. We see this Yisod also in Parshas Vayigash. When Yaakov came to Mitzrayim and Yosef went out to meet Yaakov Avinu, Rashi tells us that as Yosef cried on Yaakov’s neck, Yaakov Avinu was saying Shema. Why did Yaakov of all times choose to say Shema at the moment? Because he had such a tremendous Hargasha of love and hakaras hatov to Hashem that he knew that he had to do a Peula in order to make it materialize into something. This brings us full circle back to why I am writing this. The response from world Jewry has been amazing. We all were inspired by how a group of disparate Jews from all walks of life had a Shabbos of pure achdus, and it moves us, it makes us want to be part of that. But, now we need an action to be Mikayim this Hargasha that Klal Yisroel is currently feeling. There is a Jewish Community in Athens, Greece, and they need a Mikveh. I spoke with Rabbi Hendel and it will cost $280,000 to build the mikvah and they currently have $175,000. Let us take action on our feelings of achdus, and all of us together as one people make this Mikva happen. Whether you give eighteen dollars, eighteen cents or eighteen hundred dollars, it doesn’t matter; what matters is making a peula,an action, so that our feelings of achdus will take root and manifest into something greater. Below is a link to make a donation to Rabbi Hendel for the Mikveh. In the zchus of each us taking an action and giving something to complete this binyan together, we should be zoche to also work together to build the Beis Hamikdash Bakarov.